As a kid, my family sometimes went on vacations to Sanibel Island, Florida, a haven for seashell enthusiasts. On these trips, I always loved ordering Florida's most famous desert at the restaurants we went to - key lime pie. I have made key lime pie before, but tonight I made key lime bars. In my case, the bars were actually lime bars, since key lime is hard to come by in New York City (hint: if you are reading this in Florida and want to send me key lime juice, that would make me very happy). Even without the traditional key lime, these still taste delicious. I think the recipe could also be done with any citrus fruit by substituting the juice and zest of that fruit (lemon, and possibly tangerine, grapefruit or orange). Mix well and press into a rectangular or square glass or ceramic baking dish (I used my Emile Henry lasagna dish). Bake at 350 F for 10-15 minutes until dry and golden brown, and then allow to cool completely. To make the filling, use your Kitchen aid artisan mixer (which you may have already figured out, is my favorite kitchen appliance. First put in the egg yolks and lime zest in the bowl of the mixer, and beat at high speed for 5 minutes. I intended on using three egg yolks, but I am not actually sure if I used three or four. One of the eggs I cracked open was actually a twin, meaning that it had two yolks! I think I have only seen this once in all of my years of egg-cracking. I am not exactly sure what to say about this, but since I was a biology major in college, I found this culinary oddity to be a combination of both freakishly weird and fascinating. I guess the chicken must have come before the egg? At any rate, beat the egg yolks and zest at high speed for about five minutes until thick, and reduce to medium. Slowly add the condensed milk and mix for three minutes. Then reduce the speed to low and add the lime juice, just until mixed. 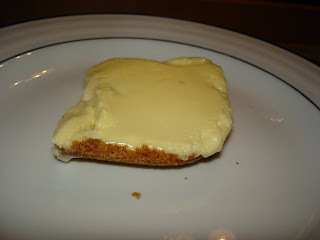 Spread over the graham cracker crust and refrigerate for at least four hours. Mine are currently in the fridge, and so pictures are not quite available yet (soon). If you want to serve with whipped cream, you can beat 1/4 cup of heavy cream in your mixer on high speed until stiff peaks form. Another note - I am a planner so, like with vacations and other life plans, I think about my food a week in advance (with the occasional spur-of-the moment decision). The key lime bars were one of my last-minute baking decisions. However, upcoming planned cooking projects include: Baked Alaska, Thai stir fry, raisin-chicken tacos, Chocolate stout cupcakes, and tomorrow night's variation of Hanukkah potato latkes to mark the start of Hanukkah. Important to note that you should key limes and not regular limes to get the proper flavor. Otherwise these are great.